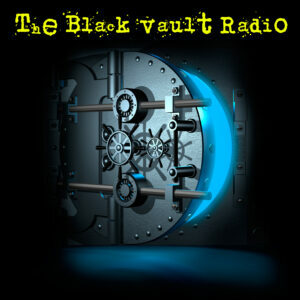 Witness Scott Dyer submitted the following case to The Black Vault / TBV Investigations on 11/06/2018 at 3:58 am PST. The case was assigned to TBV Investigator Jim Kerr for investigation and analysis. Sunday, Oct. 14, 2018, my wife and I were out working it the yard painting our Cabana which has an N.W. to S.E. placement. Approximately 1542 with a somewhat clear sky’s the moon was up and visible to the S.E. between two layers of clouds, I caught a glint or flash of something moving from the NW to SE which was not normal since I could see it but could not hear it. 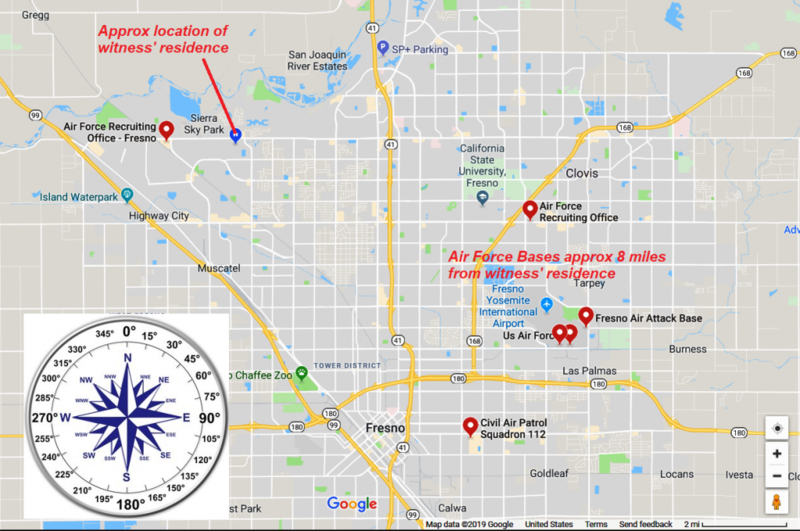 Interesting we live in the flight pattern for Fresno Air Guard, and there is a small private strip NW about 1.5 miles of us as the crow flies and there was nothing in the air at that time. It was noticeable quiet at that time. The Sphere maintained its SE course towards the moon and I would estimate our eyes on time was about 25-30 seconds. This is my 4th lifetime UFO siting; my first was 1966, 1969, 2012 and now 2018, Sorry no pictures or video. On 01/25/2019, I conducted a telephone interview with witness Dyar. I found the witness to be quite credible, honest, and knowledgeable on a variety of subjects we discussed. The witness is a well-educated individual, 63 years of age, recently retired from a long career as a computer IT expert, working for a University in charge of an inventory of more than 40 million dollars worth of computer equipment. In essence, the witness told me the sphere was approximately nine millimeters in diameter at arm’s length. He had good eyesight and did not need glasses to obtain a clear view of the object. The edges around the circumference of the sphere were not sharply defined but slightly blurred. 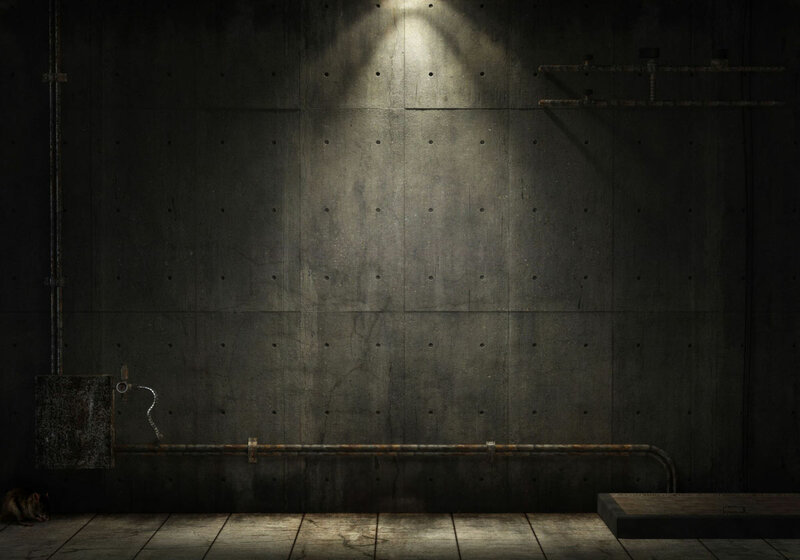 The color of the object appeared to change slightly from a whitish color to yellowish color. The altitude of the sphere was approx 500 feet, and the distance from his location was approx one mile, estimate only. Just as the object approached the moon, it turned in an upward direction and vanished. The speed of the object was approximately the same as a jet aircraft. In the proximity of his house are many airports, an Air Force Base and a Civil Air Patrol Squadron. He is familiar with the air traffic in his area. He was adamant that the object was not a balloon and appeared like nothing that he ever witnessed in the past. There were no photos or video taken of the object. Witness Dyer and his wife were working outside in his yard painting a Cabana with no camera available. by Jim Kerr, TBV Investigations. Fresno, California, 10/14/2018 at 3:30 pm. Weather source, Weather Underground. At approx 3:30 pm the temperature was 82 degrees F, Dew Point 36 degrees F, Humidity 19%, Wind Speed 9 mph out of the NW, Wind Gust 0 mph, Pressure 29.5 inches, Precipitation 0 inches, Condition Fair, and Visibility 10 miles. 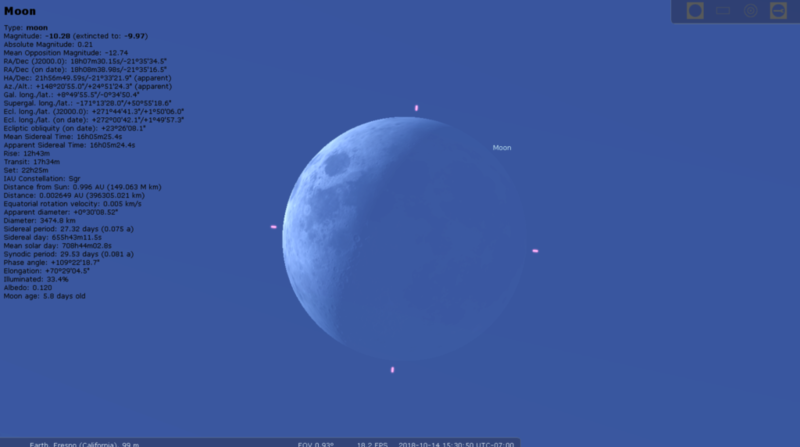 Searching the archives of Stellarium, (a planetarium software that shows exactly what you see when you look up at the stars and the daytime sky), I was able to view exactly what celestial objects were visible to the witness in his daytime sky from his location in Fresno, Ca on 10/14/2018 at 3:30 pm. According to the data available on Stellarium, there were no astronomical objects or events that can account for what the witness observed. Moon Phase/moon and sun location for Fresno, Ca. on October 14, 2018, at 3:30 pm PST. Refer to the image below. On 10/14/2018 the moon was a Waxing crescent visible at 30% illumination, age 5.35 days. The moon’s location was approximately 25 degrees above the S/E horizon at an approx 150-degree compass reading. 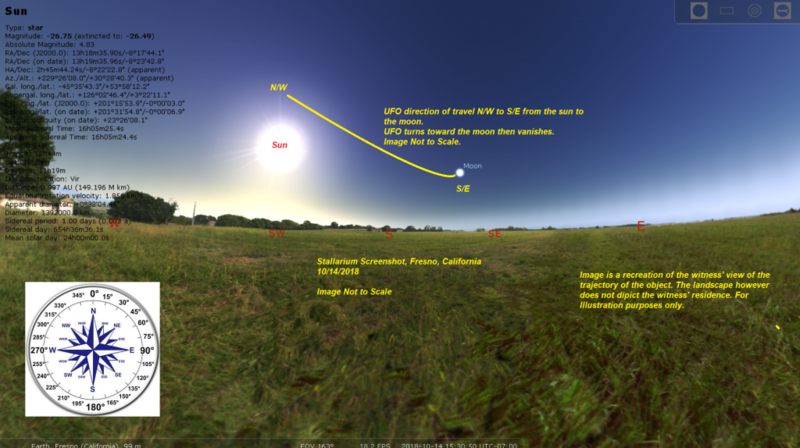 The setting sun was approximately 28 degrees above S/W horizon at an approx 230-degree compass reading. According to the witness testimony, the location of the sun and moon was approximately in the location as the data indicates. On 02/01/2019 at 11:00 am, I called the National Weather Service located in Hanford, California (website) phone number (559) 584-3752. I requested information for weather balloon launch times, dates and launch locations. The information I received was very limited, but the scientist I spoke with stated the only National Weather Service/NOAA launch site in the vicinity of Fresno, Ca. was located at Vandenberg AFB 151.8 miles S/W of Fresno. He further stated he did not have the archival data from launches at Vandenberg AFB and provided a link to NOAA (ncdc.noaa.gov) that possibly could provide the information I needed. On the NOAA website ncdc,noaa.gov, I submitted my written request for weather balloon launch dates and times from Vandenberg AFB but the documents emailed to me did not have that information. I submitted a second online request with additional search information, but again the information forwarded did not have weather balloon launch dates and times. After two requests to NOAA for weather balloon launch dates and times from Vandenberg AFB here is a pdf document of the data I received. It is also important to note, High Schools, Colleges, and Universities that offer meteorology classes launch weather balloons. It is also legal for anyone to launch weather balloons. Further research to obtain weather balloon launch dates and times will be necessary for future investigations. For this report, I wish I had the data. The flight characteristics of the object the witness described do not seem to match the flight characteristics of a weather balloon, or Helium filled party balloons. It is also important to note; weather balloons do not descend back to the ground from their altitudes of up to approx 115,000 feet. They are designed to explode at high altitudes then a parachute is deployed to return the radiosonde (electronic data transmitting computer) to earth. If located, the radiosonde is repaired/serviced then launched suspended from a new weather balloon. 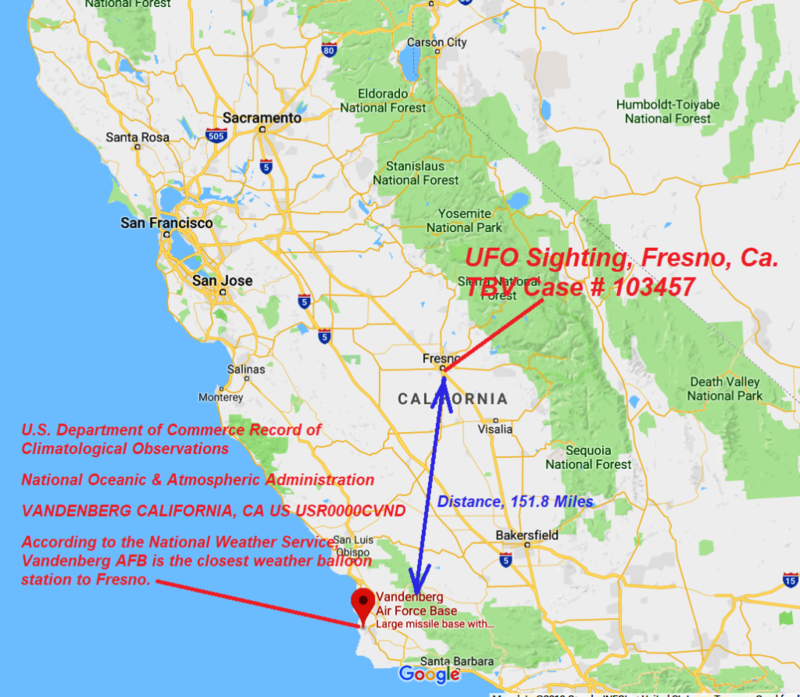 Photo of a map depicting the distance between the City of Fresno and Vandenberg AFB. Why Do Forecasters Still Rely on Weather Balloons? Below: Excerpt from the above link. Below: Excerpt from above Wikipedia link. Below are several good videos showing launches and flight characteristics of weather balloons. Keep in mind; anyone can launch a weather balloon. One does not need a license, but there are liability issues to consider, i.e., the parachute does not deploy and the payload injuries someone on the ground. No insurance company will insure weather balloons. Questions regarding liability is an issue and standards have been proposed to the FAA. Back in 2014, I investigated a misidentified object that was, in fact, a weather balloon. It was an interesting case where the witness filmed the balloon through a telescope exploding at high altitude. He claimed the balloon was a chemical device ejected from a jet as an alternative to alleged geoengineering and chemtrail activity. He referred to it as a chem.-bomb. I sent the video footage to a weather balloon manufacturer. After reviewing the footage, the manufacturer confirmed it was a weather balloon exploding as intended after reaching its maximum altitude. Advertising balloons have been popular for years and are available in many shapes, size, or color imaginable. Businesses use them for grand openings, sales or are a permanent fixture above a business. Some have no advertising printed on them and are a solid color. An internet search will find round solid color (white, yellow, blue, etc.) balloons available in sizes from 5-10 feet in diameter, even larger. These balloons can become detached from their anchor points, or ropes break causing them to be carried away by the wind. These balloons are filled with Helium. Many business use balloon companies to maintain their balloons as the Helium needs to be replaced within 4-5 days, sometimes longer. As the Helium degrades or escapes from the balloon, the balloon will still stay aloft, but if the line breaks the balloon will not reach a high altitude. Its assent rate will be much slower and altitude lower, maintaining a much lower, consistent altitude. You may have seen this happen with Helium filled party balloons inside your house. The balloon will rest on the ceiling for a day or two then begin to drop hovering in mid-air. Then a day later it will no longer float and drops to the floor. This principle can be related to advertising balloons as well. It is possible that when a 5-day-old, or older, advertising balloon escapes, it can reach an altitude of only 500-1000 feet while being carried away with the wind. It is possible that a weakened Helium filled advertising balloon is what the witness observed. However, without photos or video of the object, I can only speculate. 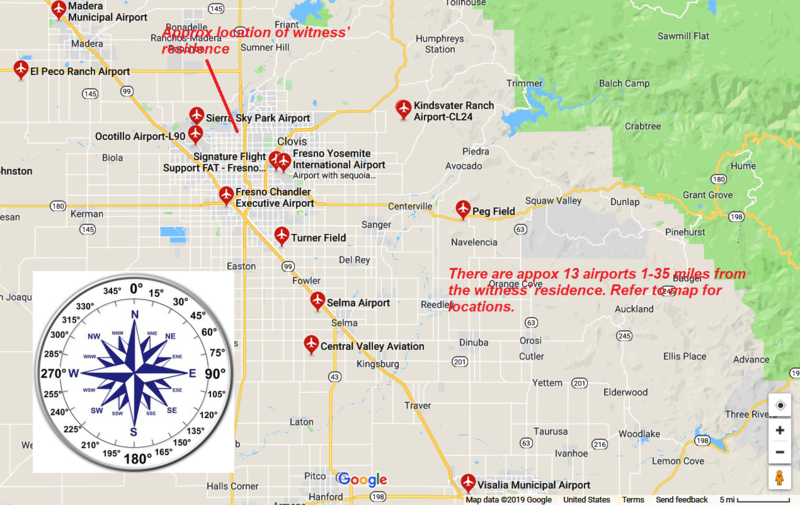 As I stated earlier in this report, the witness is very credible, educated and is familiar with observing aircraft and other objects in the sky. 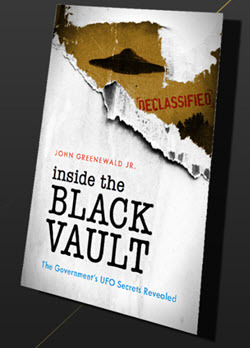 In 1966, 1969 and 2012 he had UFO sightings. His testimony to those sightings are very interesting, and I hope he submits them to TBV Investigations. To summarize what the witness observed. On 10/14/2018 he and his wife were working in their yard. The witness observed a reflection from the sun on an object traveling from the N/W to the S/E. The object was round in shape, Approx 9 millimeters in diameter, appeared to change colors from white to yellow, emitted no sound, and traveled straight at the approximate speed of an aircraft. The elevation of the object was approx 500 feet, and the distance from his location was approx one mile. When the object approached the moon, it curved upward and vanished. According to the witness, his wife’s observations were the same. The witness’ statements of the elevation of the object are consistent with the data I obtained from Stellarium regarding the location of the moon and sun. The moon’s location was approximately 25 degrees above the S/E horizon at an approx 150-degree compass reading. 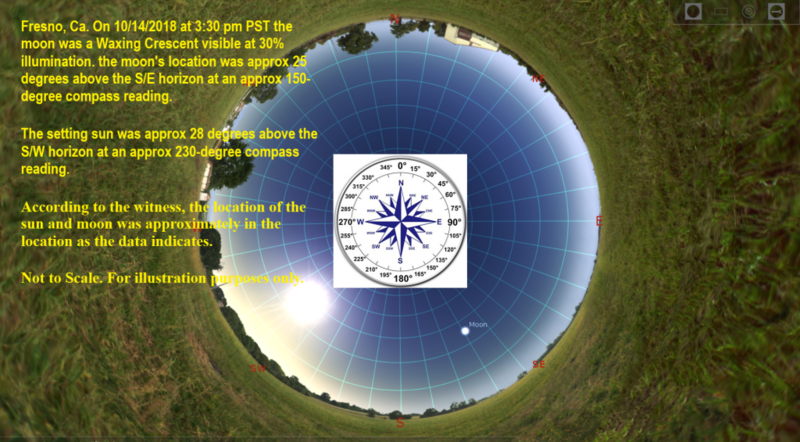 The setting sun was approximately 28 degrees above S/W horizon at an approx 230-degree compass reading. 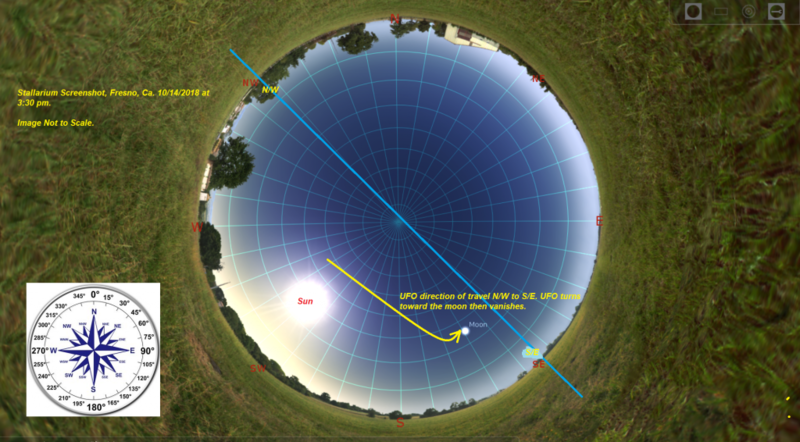 Based on the witness’ statement that the object was approx 500 feet in altitude is consistent with his view of the sun and moon that were both low to the horizon. The object vanishing when it curved toward the moon was most likely due to the 30% illumination of the moon washing out the object. However, this does not account for the witness losing sight of the object. It would only take a second or two for the object to cross the moon becoming visible once again, but the witness did not see it. I spent a lot of time researching weather balloons as I felt it necessary. Many would state it was a weather balloon, but I do not believe it was. The ascension of a weather balloon is rapid and would not travel at a low maintained altitude of 500 to several thousand feet. Weather Balloons reach altitudes of over 100,000 feet, explode, and their instruments are parachuted back to earth. Refer to the information in this report on weather balloons. An advertising balloon, on the other hand, is a possibility. If a white runaway advertising balloon with no marking had degraded helium or an alternate gas, it would maintain a low altitude similar to a two-day-old party balloon hovering between the floor and ceiling. It is also important to note that the wind speed was 9 mph out of the NW the same direction that the UFO was traveling. However, the aforementioned would not account for the object vanishing. Refer to the information in this report on advertising balloons. Diagrammed recreations of the witness’ view of the object in relation to the sun and moon. On June 04, 2013 at 12:05 pm, I filmed a UFO over Littlerock Ca. which is located in the Antelope Valley. I was facing east while filming; the wind was approx 5 mph out of the east, and the object was traveling from S to N. After interviewing witness Dyer, I realized the object in my video was similar to what he described. Long story short, while videoing, I did not see the UFO due to looking through the viewfinder. I found it later that night while viewing the footage on my computer screen. The reason I was filming scanning the sky was that one week earlier my wife and I observed a similar UFO 500 feet overhead. The UFO appeared to be harassing a helicopter, and we both thought there would be a collision. The UFO was the approx size of the helicopter minus the tail section. One week later, the date if this video, I was working in my shop and heard a helicopter, grabbed my camcorder and began scanning the sky in the hope of capturing maybe the same UFO. The helicopter can be heard in the video. I wish I would have seen this UFO in the viewfinder for extended observation. I don’t know what this UFO was, but if it was a balloon, it was unaffected by the crosswind. I have experience as an amateur astronomer, photographer, and videographer. As an investigator of geoengineering and an avid UFO hunter/investigator. I have spent many years taking video and photos of objects in the sky during the day and at night. I have filmed jet aircraft, celestial objects, birds, bugs, helium balloons, lightning storms, cloud formations and more. I had my first two UFO sightings in 1973 and several in recent years. I am familiar with helium balloons due to my youngest son’s fascination and hobby of releasing helium-filled balloons from 5-30 inches in diameter. Two years ago, for my son’s birthday, all he wanted was a commercial helium tank and an assortment of various sizes of balloons. The tank stands 5 feet tall and now in need of refilling, again. When he is older, maybe he will be a balloonist or a weather-man. I am surprised no UFO’s are reported in the area we live. Especially his nighttime launches with multi-colored flashing LED lights inside the balloons. I believe the witness observed an object he believes is unidentified. I have seen several objects and videoed two objects that closely match what the witness described. From an investigator standpoint without witnessing this object myself, and no video evidence, there is a possibility that the object was an run away advertising balloon with degraded helium. I’m not stating it was, but only a possibility. I only wish there was video taken of this object. My conclusion: Inconclusive, due to lack of video or photographic evidence.